With the news that the live action Pokémon Go movie has selected its screenwriters, I thought now would be a good time to share this fun piece from Bryony. Enjoy! As someone who grew up with Pokémon I geeked out massively when I heard Niantic were bring-ing out a smartphone app. I downloaded the app first thing that morning and I got absolutely NO writing done in my lunch break – I was too busy catching ‘em all. Looking back, that’s not the most convincing opening paragraph I could have come up with. For those of you who’ve had your head buried under a rock these last few weeks, the Pokémon-Go app allows you to discover the world via an augmented reality map. When Pokémon appear on your smartphone screen simply click on them and start throwing Pokéballs at the little monsters to capture them. The day Pokémon-Go was released I walked approximately ten miles looking for Pokémon. The following day I walked seven. Put it together and that’s more than I usually walk in two weeks (I’m lazy, deal with it!). Niantic has half the population out searching for cute, invisible monsters. It’s kind of lame if you’re looking in from the outside, but on the flip side we’re all walking and isn’t that how the greatest writers came up with their ideas? After all, walking is where creativity is born. It’s pretty obvious that staring at a blank page (something I suggest you never do) is going to get you nowhere. Playing a childish game like Pokémon-Go is just what you need to take your mind off that writing funk you’re stuck in, so if you’re blocked give it a shot. But at the end of the day, it’s important to remember not to get carried away procrastinating and forget the writing. I’ve been there. It’s not pretty. If you want to restock on Pokéballs or other items you need to visit a Pokéstop. They are quite of-ten found at landmarks or places of cultural interest. They are littered all over the city and can be found anywhere from museums and churches to popular restaurants and street art. Most writers are introverts so we spend most of our time with Final Draft and a cup of coffee. Pokémon-Go gives you the chance to leave your safe place, bathe in some good old vitamin D and geek out. Even if you’re not into ‘geeking out’ you’ll meet people who share a common interest, something that’s difficult to do from the confines of your room. Pokêmon-Go has taken the world by storm and one of the many reasons is its universal appeal. It’s a broad enough concept for children to understand and complex enough to keep adults inter-ested. The game works based on geographic logic: you can’t capture a water Pokémon without being right next to a river or a lake (they only spawn near water). It’s also important to know the strengths and weaknesses of the different Pokémon, because although some of them are obvious (fire types are strong against grass) others are more fantastical and therefore logic cannot be applied (ice types are strong against dragon). For writers just starting out, or unsure of how world-building functions, it’s a great way to experience it first hand. 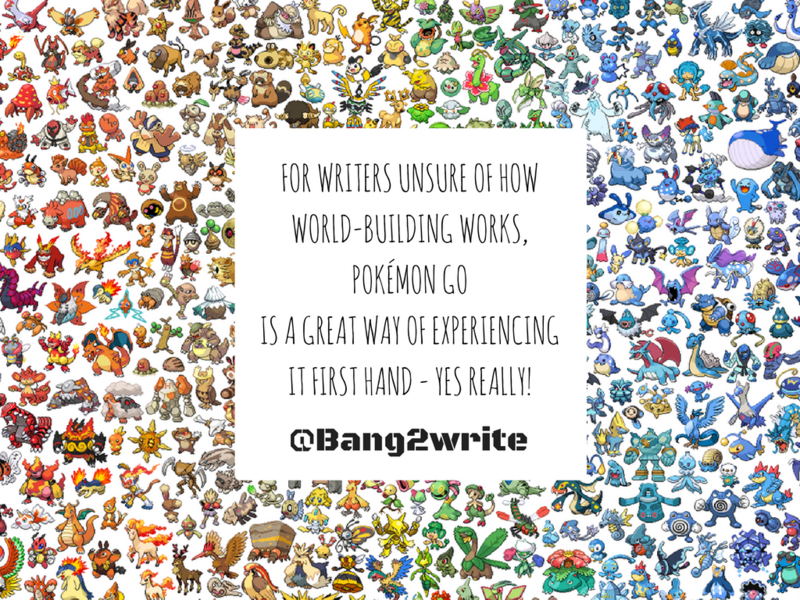 I recommend Pokémon-Go to writers everywhere, it’s one of the best apps I have on my phone. Not only because it’s creatively inspiring but because it gives us all a break from the real world. If you’ve read this blog and are sitting on the fence I’d recommend you download it. After all, it’s FREE!! You’ve got nothing to lose. Nothing except ten minutes of your time catching Pokémon! BIO: Bryony Quigly is a screenwriter who wears her love for rainbows, sunshine and all things geeky on her sleeve. She has been selected for London Screenwriters Festival Talent Campus and has recently finished working on a short film based on Dartmoor. Follow Bryony on twitter as @dialectofnotes.